These are the Original Pictures! And these are more photoshopped pictures. I think the boats look pretty good with painted topsides, especially the Tahoe. Wow! I haven't seen that Tahoe before! Its gorgeous! I originally was going to do a utility design, but I backed out because there weren't utility versions of the larger inboard runabouts. Is it possible to modify the riviera to be a Utility? It would be great to be able to carry the extra people/have space to move around. 18shamic wrote: Wow! I haven't seen that Tahoe before! Its gorgeous! I figured you'd want to see that one! Like I said, it's got me thinking of painting the sides if and when i get to that point. Also take a look at the Vintage Race Boat Shop web site and look for a boat named "Obsession" for another beautiful painted boat. As for you question about the utility version of the Riviera, Glen L has plans for making a utility out of the Monaco, which is just a shorter Riviera. You might also want to search the forum as I think there was a discussion about the utility. First let me say that I am super impressed with the work you've done on your Riviera. Sorry I haven't chimed in--I don't always get to all of the threads. Your math is impressive too! And the fact that you know so much about motors and woodworking at your age is wonderful--we need more young men like you in this world! Thank you Gayle! I think I will do a Utility design - I have been told as you get older, climbing over the engine hatch becomes less and less fun. (My parents like the open design better) And I think, if done properly, it can look amazing. Thank you for posting the links to those boats, SunFun. They gave me a lot of ideas; really gorgeous boats. I have been looking for a salvage vehicle to pull the engine out of, and while talking to one on my friends, we began to make a list of parts to salvage from the vehicle. While making the list, we came up with the idea of using the car's power steering as steering for the boat. If we could find a way to make it work It would save a lot of money and it should be just as reliable. I haven't heard of anyone else trying to do this, and I'm not entirely sure if its possible: we don't have a car yet, and I haven't taken a good look at the system. Do you guys think its a good idea? Also, I have planned hours/the schedule between now and the 4th of July. There is no way I can make the launch date if I include all the features I would like to have on the boat. (Speakers, Fancy Ignition, Nice Floorboards, RGB lighting, Interior Lights, etc.) So I am planning to launch it with rough plywood floors, a completed deck, as well as all mechanical things. But I will do the floor, and electronics over next winter, and the boat will be fully complete next year. 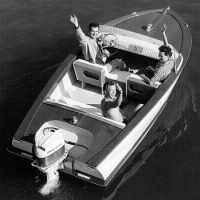 18shamic wrote: While making the list, we came up with the idea of using the car's power steering as steering for the boat. If we could find a way to make it work It would save a lot of money and it should be just as reliable. I haven't heard of anyone else trying to do this, and I'm not entirely sure if its possible: we don't have a car yet, and I haven't taken a good look at the system. Do you guys think its a good idea? It's an interesting concept but remember that power steering on a car is actually power assisted steering - the car still has a physical mechanical connection between the steering wheel/column/rack. So I don't know what it would gain you trying to use the system in a boat - steering loads aren't high enough to need assistance and you'd still need a mechanical (or hydraulic) connection between the boat's wheel and its rudder shaft. How would it save you a lot of money incorporating such a system into your boat? I suspect it would do the opposite. If it was me, and unless you have a clever scheme that i can't think of, I'd junk the power steering system along with the a/c and just stick with the alternator on the front of the motor. Keep it simple - less to go wrong. I'm still really pleased with the finished colour scheme we went with, white hull, blue sides, mahogany and a New Zealand timber called Kauri as deck infill. A few things have happened since I posted last. I have applied more 3 coats of primer, with lots of sanding in between coats. One day, it was drizzling outside, so I figured I should take it outside and wet sand it. I am just about ready for paint, I should be painting very soon, within the next few days. I am also patching some gouges/runs, filling them and sanding everything so its all smooth. The right side of the boat turned out beautifully, while the left side is covered in these gouges and bumps, which is causing all the delay. But the more troubling matter is the sketchy $400 transmission bought off of e-bay. (ZF63a) The time for my school project is approaching, and everything needs to be in order if I am going to accomplish a working drivetrain in three weeks. (Its also required to get credit for the project) After a month and a half in my garage, the Transmission has leaked no ATF since arriving. (there was a small puddle on the shipping palate, due to being shipped on its side) But tonight, we came home and noticed a sizable puddle forming on the towel I had placed beneath it. (This happened within the last two days, It was dry Tuesday) Seeing it was ATF, I removed the cap and found it to be overflowing with extremely watered down ATF. The transmission was not in the water, and the only thing I can think of is the rapid change in humidity. Over the last day it has suddenly gotten very hot and humid. I am really confused as to what could have happened - I have since put a new rag underneath the transmission with the cap off, to see what happens. Any advice? Im trying to avoid rebuild costs, but I want to do it right. 18shamic wrote: I have been looking for a salvage vehicle to pull the engine out of, and while talking to one on my friends, we began to make a list of parts to salvage from the vehicle. While making the list, we came up with the idea of using the car's power steering as steering for the boat. If we could find a way to make it work It would save a lot of money and it should be just as reliable. I haven't heard of anyone else trying to do this, and I'm not entirely sure if its possible: we don't have a car yet, and I haven't taken a good look at the system. Do you guys think its a good idea? The pump, reservoir, and especially the rack have considerable weight. Even an unpowered rack probably weighs 12 pounds. That's a lot to be hanging on the back where you already have a large load (the motor), and is probably major overkill for a boat. Some types of ATF are hydroscopic, meaning they absorb moisture from the air. If there's ANY water in it, you need to drain, flush and refill. Otherwise, you're just begging for internal failure. Make sure you use the recommended fluid to refill. Not all ATF is the same (i.e. ATF 4 is not the same as dextron, etc. ), so use what it was designed for to get smooth operation. BTW, I love the custom cover for the bow. Since I have posted, I have painted the boat. I have had trouble getting a wrecked car, so we just went and bought a 3uz-fe from a local friend. It came from a wrecked Lexus SC430 with 130k miles on it - we picked it up with an engine computer, wiring harness, gas pedal, ignition, steering column, and immobilizer for $1800, which isn't bad. These engines are known run 400k miles without any problems, so I hope I get at least 10 years out of it before replacing it. I heard that 100 hours is equal to 11,000 miles on the engine, so I figure I should be okay for 10 years. I officially start working on the engine Wednesday. Since it is a school project, I have to do it on a separate blog. I will be doing a daily video series for the three weeks to document everything, but I have to post each video on a separate blog - Link here: http://hawkenprojects201718shamic.blogspot.com I will be very busy: I have to replace the water pump, timing belt, as well as the entire front end of the engine. My goal is to get all this done so its running in the boat in three weeks, but I am skeptical. I will try my best though; anything is possible. Today, I managed to get the engine onto an engine stand and I cleaned it. I have attached pictures of the boat in its current state below. More Pictures! I look so happy when I am cleaning the engine because of this really cool expanding foam degreaser. I can be amused by the simplest things.